Eight Mississippis. That’s how long it took me in a full sprint. One Mississippi got me out the door. Three Mississippis got me past our shed. Four Mississippis I was at the end of the driveway. Six Mississippis I was past the dusk-to-dawn light. Eight Mississippis I was there. Eight Mississippis got me from my house to my grandparents’ house. After that, it was two clicks. Two flashes of the front porch light. Our signal to my mom waiting back at the house that I had made it safely across the two yards and into my grandmother’s arms. Two flashes back meant message received. For much of my childhood, we lived next door to my grandparents. I was the luckiest kid on the planet and I didn’t even know it. There are nights now I can feel every one of the long, heavy 189 miles separating me from my Mammaw. But there are also nights after an hour-long phone call with her that I feel like we’re still all on the same street. 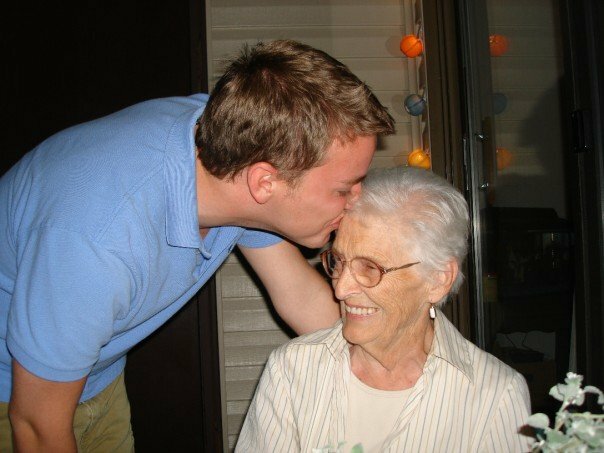 Alzheimer’s Disease robbed me of a relationship with my grandfather. But I’ve been lucky to have my grandmother. All of her. All of her insight. All of her grace. And all of her love. At 88 years old, she’s outlived all nine of her siblings. I used to think she’d out live all of us. That she’d always be there. That she’d always be eight Mississippis away. But I know that’s not really the case. I know there will be a day that I won’t reach her by sprint, drive or phone. I recently took a trip to see her. This time I brought along a digital voice recorder. We stayed up most of the night talking. Story after story; lesson after lesson. Some I had heard many times before. Some I heard for the first time. But this time, not only are her stories in my heart, they’re also on my hard drive. It’s a project I’ve wanted to do for a long time. And if I’m lucky, I’ll get to record more. I hope to eventually transcribe portions of the digital files and post them here. A snapshot of a woman who could fill the 1,073 hours my recorder promises to hold, and then some. Parts of her that will last forever. Even when she’s not eight Mississippis away. This entry was posted in Personal and tagged childhood, digital voice recorder, family, grandmother, memories, technology. Bookmark the permalink.